Of hundreds of juicy anecdotes in Ken Mandelbaum’s indispensable volume Not Since Carrie: 40 Years of Broadway Flops, one stands out perhaps a little more than the others. It’s about a show called Reuben Reuben which closed out of town in 1955. This was a through-composed absurdist piece by Mark Blitzstein, and Mandelbaum reports that on the opening night of the show over 300 audience members walked out of the Shubert Theater in Boston. One of the walkouts spotted the composer in the lobby and asked if he had anything to do with the show in question. When Blitzstein said he’d written it, the man punched him in the jaw. Now, why exactly am I repeating this story? Well, it’s because it illustrates how I felt seeing Bartlett Sher’s production of L’elisir d’amore at the Met on opening night a week ago. I literally wanted to punch Sher in the face. I didn’t of course, partly because I didn’t happen to run into Sher but mostly because that kind of behavior can lose a critic his credentials. But I wanted to. This wasn’t the worst opera production I’ve ever seen. But it was perhaps the most infuriating, because Sher had the time and money to do something clear and definite with what is after all not one of the more complicated pieces in the repertoire. Instead he chose to squander those resources on obfuscation and pseudointellectual posturing. In other words, the Met just spent something like a million dollars so Sher could act like he is smart. The problem is, he’s not, and the production is a disorganized mess. Here’s the problem: in Sher’s mind, it’s apparently not enough for L’elisir to be a romantic comedy. It has to have an Issue. Now, any Issue will do, apparently, and so he latches on to the political. The opera, he says, is about the Risorgimento, the grassroots movement for Italian unification that spanned most of the 19th century. Now, what about this particular opera suggests there is some kind of implicit nationalistic message lurking behind the farce plot? Well, the opera was written in the 19th century, to start with, and there are some soldiers in it, and there was an occupying army in Italy in the 19th century that also happened to be made up of soldiers. And, as if that isn’t enough… well, actually, that is enough, because that’s all that Sher’s got. And how is this “theme” of nationalism developed in Sher’s staging? Well, Belcore’s soldiers are a little rougher and nastier than you generally get, though it should be pointed out that their behavior (and the reactions of the other characters, e.g., Adina) are played for laughs. Adina still agrees on a whim to marry Belcore and she displays no misgivings in the second act. She and Nemorimo even set up “Austrian” Belcore and “Italian” Giannetta in the finale ultimo: what’s the sociopolitical meaning of that supposed to be? Worse, the “Risorgimento” motif has nothing to do with Dulcamara, the love potion, the coincidental reversal that Nemorino’s late uncle has left him a fortune, the anagnorisis of “Una furtiva lagrima,” or, in other words, basically everything that drives the story of L’elisir. It’s a slogan, that’s all, a label. Now, I’m not opposed to a director’s finding unexpected or even contradictory meanings in a familiar work. 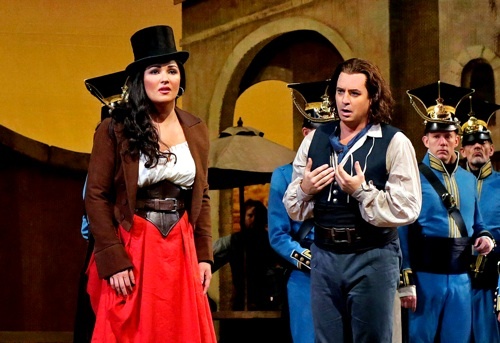 Dmitri Tcherniakov recently directed a production of Il trovatore that had only a glancing association with the story of that opera as we generally understand it. The focus of this production was on mood (a sense of mystery and instability) instead of narrative. Even moments that resembled conventional narrative didn’t really make sense rationally, because—and here, I think, was Tcherniakov’s point—we weren’t given enough information to connect the dots. But even so radical a reworking is arguably organic to the dramatic basis of Il trovatore: it is, after all, a drama about people trying to find out who they really are, and sometimes being very unhappy when they discover the truth. By contrast, Sher’s “meaning” is utterly trivial. It’s slathered over the surface of the work, and, to tell the truth, even the slathering is not all that successful. Unless you read the program notes or you happen to be an expert on Austrian military regalia of the early 19th century, there is no sense in the action as presented by Sher that Belcore represents an occupying force: he’s just Miles Gloriosus in epaulets, the same as always. The problem here is that we don’t have a production designed by Oliver Messel, but an “Oliver Messel production” designed by Michael Yeargan and Catherine Zuber. It’s a 21st century take on a mid-20th century take on 19th century romantic realism, and all those nested quotation marks add up to something that is at best insincere and at worst cheap-looking and inexpressive. The opening scene of Act 2 quite simply looks like a 50 year old set touched up a bit for one last run before the company springs for a new production: very similar, in fact, to the Bing-era Gioconda and Falstaff that still teetered on the Met stage in the early 2000s. And again, part of the charm of “ironic” design is delight in its obvious artificiality: how well the little machine works. This little machine worked very badly indeed. To begin with, a massive false proscenium nearly halved the Met stage and surely robbed a significant part of the audience of a decent view of the stage. From my critic’s seat not too far off center orchestra, much of the stage picture was filled with the velour masking on stage left. I hate to think how little people in Family Circle or the side boxes must have been able to see. Then, halfway through Act 1, the show curtain was lowered on the town square set, and for five minutes we sat impatiently in the dark as the sound of bangs and thumps issued from the stage. And after this immense wait, the curtain rose on… a slightly different town square set. 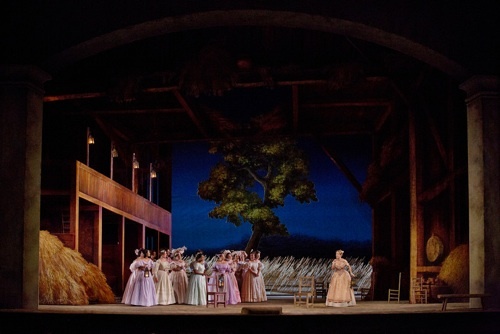 Even setting aside the pointlessness of this scene shift, cannot the Met with its state-of-the-art technical resources accomplish an “a vista” change that any provincial 19th century Italian theater would have done as a matter of course? No, actually. In Act 2, Sher tried for an a vista effect and ended up with something that looked like a Robert Wilson show performed during a stagehands’ strike. A group of elegantly dressed men and women shlepped the wedding party’s furniture offstage as various bits and pieces of the barn set moved up and offstage. And then these same chic supers dragged onstage – in slow motion! – ground row pieces adorned with three-dimensional stalks of wheat. All this distracting busy work went on, mind you, not during a throwaway piece like the women’s chorus with Giannetta, but rather while Adina and Dulcamara were valiantly trying to put over their patter duet. After all this, it seems sort of pointless to talk about characterization, particularly since Sher’s direction has most of the cast playing the usual shtik and the leading couple doing wrong-headed stuff. Well, half the leading couple, anyway. Anna Netrebko plays “Anna Netrebko,” the wacky hoyden routine she did in Don Pasquale, when she’s not distracted by that silly top hat that keeps falling off her head. And Matthew Polenzani as Nemorino– are you ready for this? – he plays Hamlet. Sher says so in so many words, though from where I was sitting I saw a lot of Werther: an angsty emo guy who keeps a journal. Everybody runs around waving their arms a lot (that means it’s a comedy) and Mariusz Kwiecien spends most of the night facing into the wings or upstage, which means you have to have to accept the fact of his singing mostly on faith. Dulcamara, as mentioned before, has only the most tangential connection to the story, so he mostly just hangs around in funny costumes, except in his big patter aria, when he’s hidden upstage of the crowd. This entry was posted on Sunday, September 30th, 2012 at 2:06 am	and is filed under Rough and Regie. You can follow any responses to this entry through the RSS 2.0 feed. Both comments and pings are currently closed.